This duck rice and gravy is made The Cajun way and is the property of Andrew Guidry. Used with permission. Stuff each duck with a jalapeno and a slice of apple. Season the outside generously with the Cajun seasoning and rub the spices in. Cut the onion, bell pepper, and remaining apple in as small pieces as you can. 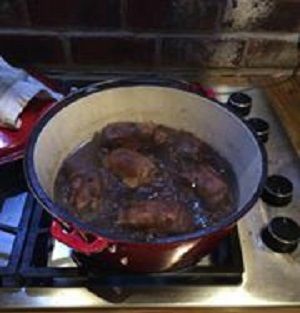 Using a medium cast iron pot, add enough bacon grease to coat the pot to about ¼” thick. Over medium heat, “brown” the ducks on each side turning every 3-5 minutes until golden to dark brown. Be careful not to burn the ducks. Scrape the pot to keep any build up from burning. Once the ducks are “browned” to color, remove them and set them aside. “Brown” the onions, bell pepper, apples, and garlic until caramelized. Add ¾ cup of hot water to start your gravy. Once the gravy is boiling, add the ducks in the sauce and fill with hot water until the ducks are submerged. Cook on medium to high heat up to 2 ½ hours or until the ducks are tender enough to pull the legs off. Keep enough water in the pot to maintain the ducks about half way submerged, turning them every 3o minutes. Taste the gravy and add flavoring and browning sauce to taste. In a rice cooker, add two cups of medium grain rice and two cups of water. Cook until done. Serve the duck with gravy over rice and a side of your choice. NOTE: If you are going to use a larger duck such as Mallards, Gadwalls, or Canvasbacks, cut the ducks into 1/8ths and add the jalapenos to the gravy whole.